A highway closed off for a week in B.C. 's Southern Interior is expected to partially reopen Monday morning along with a more direct detour. Highway 97 is the main transportation corridor between Kelowna and Penticton. It was closed down on Feb. 2 after a rock slide just north of Summerland. The closure resulted in long, circuitous detours, which left some residents frustrated or, worse, stuck. DriveBC says that a single lane in each direction on Highway 97 is expected to open at 5 a.m. PT on Monday. The Ministry of Transportation and Infrastructure announced Thursday that it was building a 900-metre detour around the area. It's a two-lane connector from the highway to Callan Road, running east of the highway. 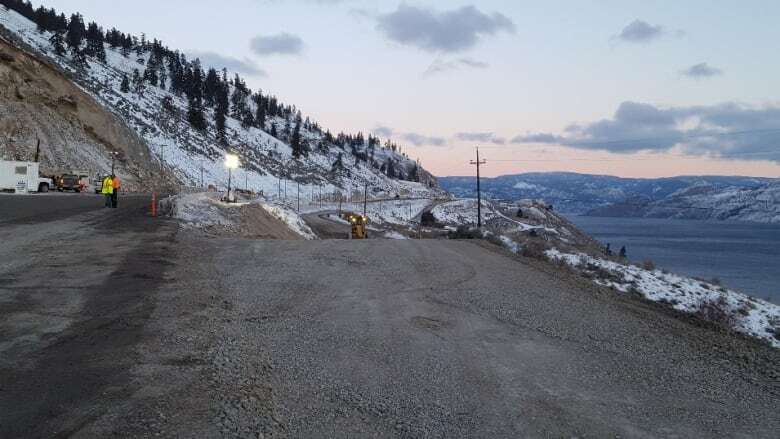 "This will provide travellers with a safe, two-lane direct route around the highway closure north of Summerland," said the ministry in a release. The detour will also open at 5 a.m. PT Monday and can accommodate both light vehicles and commercial vehicles. The speed limit along the detour route is 30 km/h. The ministry says there could be stoppages for blasting work but not between 7 a.m. and 9 a.m. and 4 p.m. to 6 p.m.
Commercial vehicles larger than 3.8 metres in width are only permitted on the detour between midnight and 5 a.m. Pedestrians and cyclists will not be permitted on the detour.